A former used car lot along West Colfax Avenue has sold and redevelopment is planned. 4190 West Colfax Avenue LLC purchased the property at that address last week for $1.5 million, according to county records. 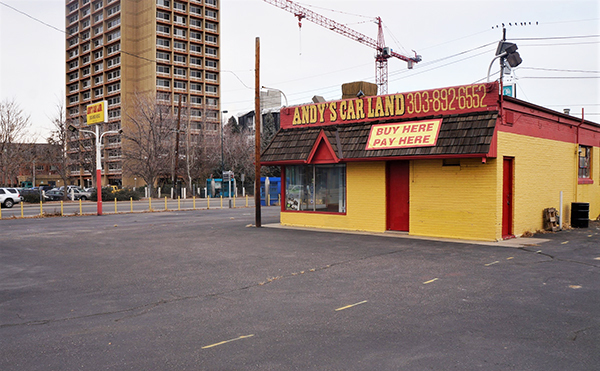 Andy’s Car Land previously operated at the 0.43-acre site, which is on the southeast corner of Colfax’s intersection with Raleigh Street. The LLC that purchased the property was formed by Matthew Sanchez, broker-owner of Marketplace Realty. Win King of King Commercial Real Estate represented the buyer, who he said plans to develop a mixed-use project incorporating housing at the location. The sale price works out to $80 per square foot for the land. The property was sold by A-B&T LLC, which is affiliated with the former owners of Andy’s Car Land. The last arm’s-length transaction involving the property was in July 2003, when it sold for $435,000. Hayden Hirschfeld and Dorit Fischer of NAI Shames Makovsky represented the seller. The lot is the second at the intersection to sell in last than two months. In October, the former auto body shop on 0.22 acres at 4200 W. Colfax Ave. sold for $755,000. The new owners told Denverite last month that they want to convert the structure into a two-room motel with a pool and bar, and give the place an artsy and retro vibe. And across Colfax, senior housing community Metro Denver Village wants to build a four-story structure on its parking lot.